Even though everyone is officially hyped up for the arrival of next generation consoles this Fall, that didn’t stop EA Sports from releasing its annual iteration of FIFA on the current roster of platforms. Not that it’s a shocker – even PlayStation 2 versions were being made long after the debut of the PS3. With FIFA 14, the developers have opted to have a deep look at the mechanics behind this game of football. There aren’t any big selling features here, instead this is a refined experience that focuses on the best aspects of the franchise. The most immediate change comes from the main menus themselves. Based on panels, not unlike the Microsoft Metro interface, the game manages to present everything in a sleek yet highly organized manner that’s easy to navigate. You’ll be prompted to get into the game’s most prominent mode of FIFA Ultimate Team almost from the outset. The basics remain the same – build a squad using player cards, and guide them to glory in offline and online leagues and championships. Unlock new card packs by spending credits that are earned by playing matches. Unlike in previous years, the game does everything it can to reward you with player packs and get your team to improve as soon as possible. Returning FIFA players will be granted freebies right away, while newbies will benefit from a tutorial-like Manager Tasks system that also awards plenty of packs. It won’t be long before your team has a very decent and skilled roster, at which point you’ll just need to worry about chemistry and formation. This focus on letting players build a decent squad as soon as possible goes a long way to proving that EA isn’t just concerned with making you pay real cash for player packs. And while the progress does slow down overtime, you’ll still be able to keep a competitive squad easier than in previous years. 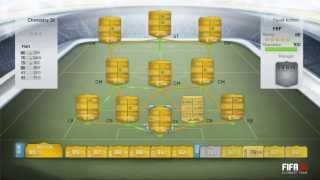 One gameplay addition in FUT 14 is the introduction of individual player Chemistry Styles. These styles essentially act as boosts, letting your players get an increase in various performance stats when you apply a certain style. Another addition is the loyalty, requiring footballers bought on the transfer market to play a few games before they are fully integrated into the squad. Finally, the Seasons play has been expanded to 10 divisions for better player segregation and more to strive for. FUT’s addictive nature is as strong as ever in FIFA 14, and worthwhile changes have been made to make this mode more accessible and enjoyable. Other modes remain unchanged as well, but expanded in various ways. In Career mode when playing as a manager sees a revamped scouting and transfer system. Much more similar to something found in football management sims, the new scouting requires you to manage staff as they discover players in various nations across the globe. You’ll need to decide on scouting parameters and sign players based on estimated level. No longer are you able to use the transfer market and sort the results by overall ability – a step towards realism, but one that might annoy some players. There aren’t any notable changes in the player Career mode. As mentioned, most of the changes begin to materialize on the pitch. Right away, FIFA 14’s players feel heavy and unhurried in their movement and animations. However, this doesn’t stop some problems with player speeds and catching up on defence. Ball physics are improved somewhat, as is teammate AI, but these changes are easy to miss during the intense speed of a match. More prominent are the control updates; you can now sprint dribble, take more accurate touches of the ball, and no longer need to use a button modifier to perform skill moves. It’s all aimed to make the game more free flowing as well as accessible. Lastly, so-called Pure Shot mechanics improve the feel and weight of the shots you take. There is definitely more variety than ever for taking a chance at goal, however it seems the AI goalies haven’t yet been fully adjusted and let in some really weak attempts even at the highest level of the sport. FIFA 14 plays and feels differently than last year’s version, mostly for the better. In the multiplayer arena, there are also no new modes. Instead, the Match Day Online feature set – which dynamically adjusts player ratings based on their real life performance – makes its way into Seasons. So anytime you’re playing a competitive match, you will be using the latest player rankings and statuses instead of just the default roster. This also applies to returning Co-Op Seasons mode, with 2v2 ranked online play. Connectivity has been fairly stable in the opening weeks and no major technical problems to report when playing online. Constant disconnects from EA Football Club are also seemingly mitigated. As always, FIFA 14’s presentation is top notch. Real teams, players, and stadiums create a strong sense of atmosphere and authenticity. Graphical touch ups are most notable with arenas, which are brimming with life. On the other hand, most celebrations and presentations are still the same. Similarly, commentary is terrific and includes up-to-date insights on players and coaches, but not without some repetition. Soundtrack selection is, again, nearly perfect. FIFA 14 celebrates the best of what the series has come to offer during this console generation. It lacks any major revamps, likely because the developers had to concentrate on the next-generation version set to hit in the coming months. But that doesn’t stop the game from once again taking the crown of soccer games this year. It plays well, presented with style, and full of modes. FIFA 14 is a great footy package, if not a revolutionary one. Visuals haven't changed much, but this is still a solid looking game with top notch audio. FIFA 14 is more about refining rather than reinventing, and the action on the pitch unfolds with more finesse and realism than before. A wealth of modes as enticing as usual, though nothing new in particular aside from updated scouting options. Updated FIFA Ultimate Team reward system encourages player participation without spending real cash. Other online improvements are marginal. As is usually the case, this year's FIFA is a solid football game that any fan can enjoy. It doesn't offer anything groundbreaking, but it's difficult to deny the level of quality and polish on display.